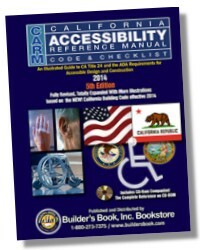 Everything you need to pass the General Building License exam for the State of California. 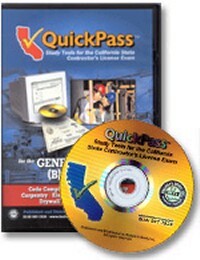 You’ll find hundreds of multiple choice questions and answers to help you pass the state exam. 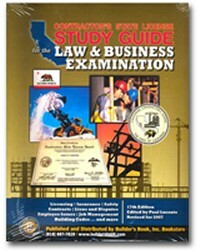 Originally written for the State of California, this exam guide can be used to help you raise your score on any state’s licensing exam. Includes two books: a study guide and a sample test. 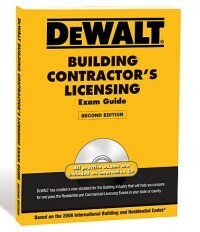 Enclosed is everything you'll need to pass the General Building test. Follow the "Course Outline" and review the material as often as you can, until you feel comfortable with it. After all, it's a subject you practice professionally, so most of the terms are already familiar. It's our intention to walk you through the State Examination, so caution is exercised by asking you to "forget the way you do things and do it our way for the test." 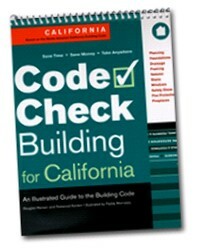 Remember, the exam is based on minimum state standards and not necessarily local codes. A General Building Contractor is a contractor whose principal contracting business is in connection with any structure built, being built or to be built, for the support, shelter and enclosure of persons, animals, chattels or movable property of any kind, requiring in its construction the use of more than two unrelated building trades or crafts, or to do or superintend the whole or any part thereof. This does not include anyone who merely furnishes materials or supplies under Section 7045 without fabricating them into, or consuming them in, the performance of the work of the General Building Contractor. 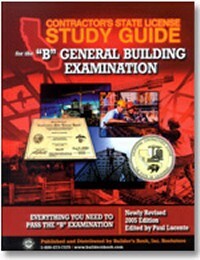 This unique study guide has been used by thousands to pass their "B" General Building Examination, with a minimum of time and expense.